Reviving the Propaganda State - CEPA STRATCOM PROGRAM. Are Western actions to blame for the steady deterioration in U.S.-Russia relations? While the Kremlin’s view of the West has long been hostile, the spread of “color revolutions” in the early 2000s acted as a catalyst. Fearing a similar revolution at home, Putin’s “political technologists” worried that they lacked powerful stories, symbols, and the means to mobilize youth in support of the government. The Kremlin subsequently undertook a systematic effort to transform the country’s own history into a tool of the state. The retelling of Russian history—and the revival of potent anti-Western narratives—became an important component of the regime’s survival strategy. Parts of the old propaganda state were being reborn—with significant consequences for Moscow’s relations with the West. 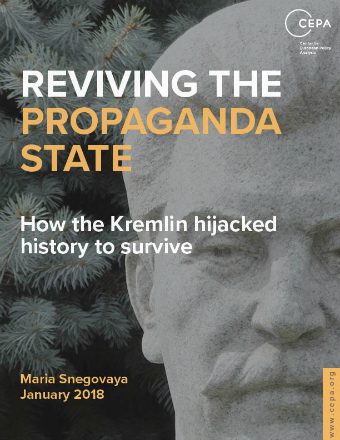 In the first of a three-part analytical series on Russia, the Center for European Policy Analysis (CEPA) publishes its latest brief on “Reviving the Propaganda State: How the Kremlin hijacked history to survive.” In it, author Maria Snegovaya dissects how the Kremlin reimagined Russia’s identity to support its policies both at home and abroad. It was the starting point for two of the most influential narratives in the Kremlin’s contemporary propaganda kit: the “predatory West” and the glorification of Russia’s past. Snegovaya concludes that not only is the Kremlin successfully reframing contemporary perceptions of Russia, but that its propaganda pen is not yet out of ink.